NEW ORLEANS (AP) DeMarcus Cousins slammed a water bottle on the floor, angry about the way he was playing and the two early fouls that led coach Alvin Gentry to sit his star center earlier than planned. Water spilled onto the court, causing a delay as Pelicans staffers scrambled to sop it up with towels. 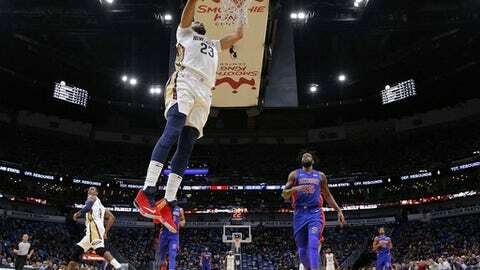 By the end of the game, the Pelicans’ mercurial big man had redeemed himself with a late-game flourish that helped New Orleans hold on for victory after Anthony Davis was forced from the game with a sprained right ankle. Cousins scored 16 of his 20 points after Davis hobbled to the locker room in the third quarter, lifting New Orleans to a 112-109 victory over the Detroit Pistons on Monday night. Rajon Rondo capped a 12-point, 15-assist performance with two transition layups in the last 1:21 to help secure a victory the Pelicans needed to restore morale after a listless blowout loss in Minnesota over the weekend. Davis dominated before he left with 4:41 remaining in the third, scoring 30 points and grabbing 10 rebounds in 27 minutes. Cousins, who also had 10 rebounds, elevated his game with aggressive drives and added a timely 3-pointer. E’Twaun Moore contributed 23 points, moving well without the ball to get open for high percentage layups and floaters. Detroit coach Stan Van Gundy was exasperated by his team’s inability to get stops. Scoring was not as difficult for Detroit until the final 12 seconds, when Avery Bradley missed two jumpers that could have tied the game. Tobias Harris scored 25 points and Bradley had 24 for the Pistons, who’ve lost three of four. Andre Drummond, who missed two of Detroit’s previous three games, had 16 points and 14 rebounds. Drummond converted alley-oop and driving dunks in the last 1:04, pulling the Pistons within 111-109 with 39 seconds left. But Bradley missed a 21-footer with 11 seconds remaining and was off the mark with a 3 that could have tied it after Holiday missed one of two free throws with 5 seconds left. Pistons: Fell to 8-13 on the road. … Former Pelicans guard Ish Smith had 16 points. Reggie Bullock and Dwight Buycks each scored 10 points. … The Pistons were 8 of 27 from 3-point range. … Forward Stanley Johnson missed his fifth straight game with an injured right hip flexor, but Van Gundy said he should return to action soon. Pelicans: Rondo had nine of his assists in the first quarter, tying a franchise record. … Pelicans reserves scored only 13 points. … New Orleans made 6 of 22 3-point attempts, but shot 56.1 percent (46 of 82) overall. New Orleans led by 14 halfway through the third quarter, when Cousins found Davis for a fast-break dunk. But Davis hurt his ankle less than two minutes later, and the Pistons capitalized with a 9-0 run highlighted by Bradley’s 3-pointer and driving layup. New Orleans also was in control early and led by as many as 11 points in the first quarter when Moore hit a layup and an 18-foot pull-up on consecutive possessions. But the Pelicans’ rhythm seemed disrupted after Cousins was called for a couple quick fouls. Early in the second quarter, Detroit tied the game on Buycks’ driving finger roll, and the Pistons led by six on Bradley’s layup minutes later. Davis helped New Orleans regain momentum and take a 59-56 lead into halftime. Pistons: Visit Brooklyn on Wednesday night.